Shadow kid Johnny, who many of our readers have been following since last spring because of his reading struggles due to severe dyslexia, has transitioned well to middle school, and received an “A” in reading on his most recent report card. Watch Johnny’s story by clicking here. Rosa had good reason to worry. Two grade levels behind in reading in fifth grade meant Johnny wasn’t keeping up with his peers, which statistically, put him at risk of dropping out of school. 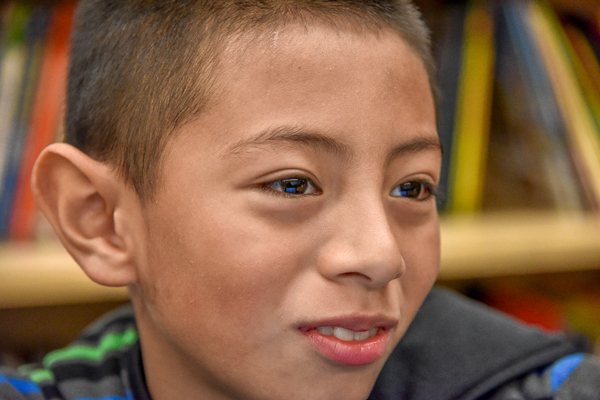 But when The Shadow Project gave Johnny access to Learning Ally’s audiobooks so he could read with his ears, he gained confidence, building his fluency, vocabulary, and decoding skills, which then helped him progress to reading written text. Research has shown that hearing text as it is read can actually boost comprehension not just for children with learning disabilities, but for all budding readers. Johnny’s helpfulness also extends to Rosa—he helps her with the forms she needs to get going again on her GED—and to other kids with learning challenges. 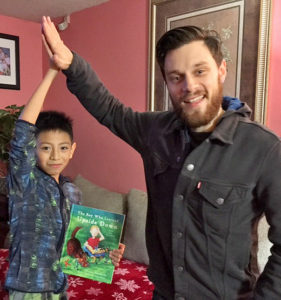 During a Christmas visit with Alex, the boy in The Boy Who Learned Upside Down, Johnny was enthusiastic about sharing his story to inspire other kids to keep trying. “Johnny loves school,” says Rosa.